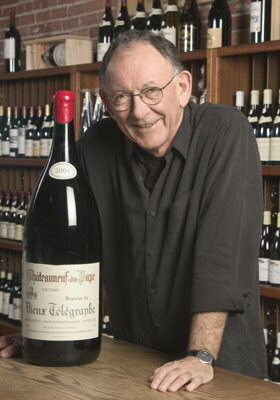 We have long been fans of renowned wine importer Kermit Lynch out of Berkeley California. Maybe it's because we share the same philosophy toward wine: keep it simple, disregard a lot of the ratings (at the very least don't be totally influenced by them, they are one man and his tastes), learn what you like, only buy what you've tasted, find the best value for the money and most of all, don't worry so much about it -just enjoy it. His insouciance aligns with ours, as does his taste. He brings in outstanding wines. Every Kermit wine we've tasted has been well made and represents its region beautifully. Many are organically grown - all are unfiltered. With that preamble, we are very excited to announce that we are carrying many Kermit Lynch wines. You might even say that our list is being crowded with his wines. And why not? In this case, you can't have too much of a good thing.